PDF of the entire issue (6.56 Mb). 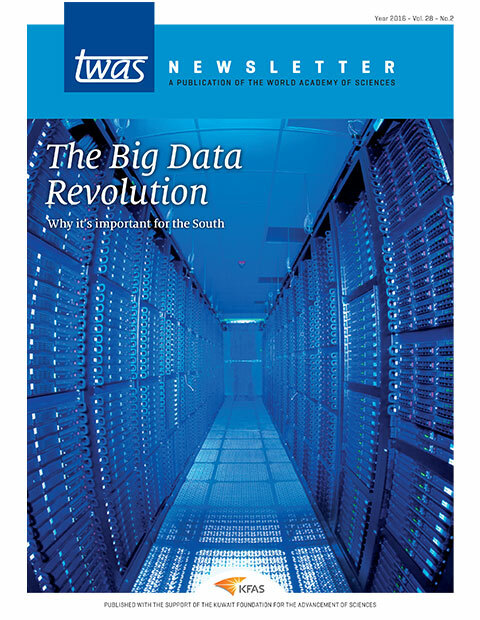 TWAS President Bai Chunli: The South must be part of the big data era. Genetically-modified mosquitoes show success in controlling dengue fever. How can less-developed countries keep from being left behind during the big data revolution? Four front-line international science groups urge endorsement of an accord for open access to publicly funded “big data”. Two African data experts say scientists, policymakers and the public must join to achieve big data’s potential benefits. The TWAS executive director leaves for a key position in Paris; founding Executive Director Mohamed Hassan returns ad interim. At the IAP conference and a related workshop, scientists explore the need for high-impact links to policymakers. Three international science and medical academy networks combine to form the InterAcademy Partnership. The Turkish-born scientist shares the 2015 Nobel in chemistry for DNA research. Early-career biologists from Indonesia, Nepal, Peru, Uganda and Yemen were honoured for work in health and nutrition. A new TWAS monograph profiles ICIMOD, the International Centre for Integrated Mountain Development.